Sixth floor. The luxury and comfort of simplicity. Marc Newson. 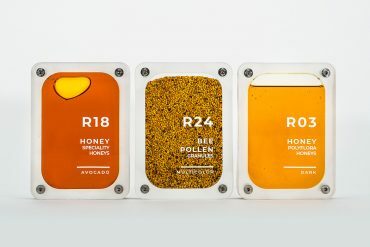 To Marc Newson’s opinion, the project has been an excellent opportunity to improve on all the things that had always bothered him about hotels. In this project, Newson proposes an idea of space where the guests do not feel that they are in a ‘designed space’. Simplicity and comfort are the two adjectives that best describe his design. 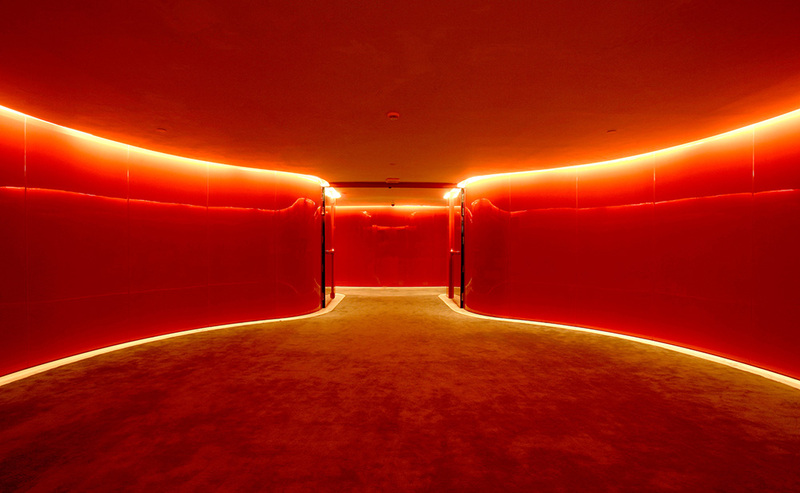 Space of the lobby and hallways is completely minimalistic and uses reduced palette of materials: wood lacquered a brilliant red for the furnishings and marble with wool carpeting for the floor. 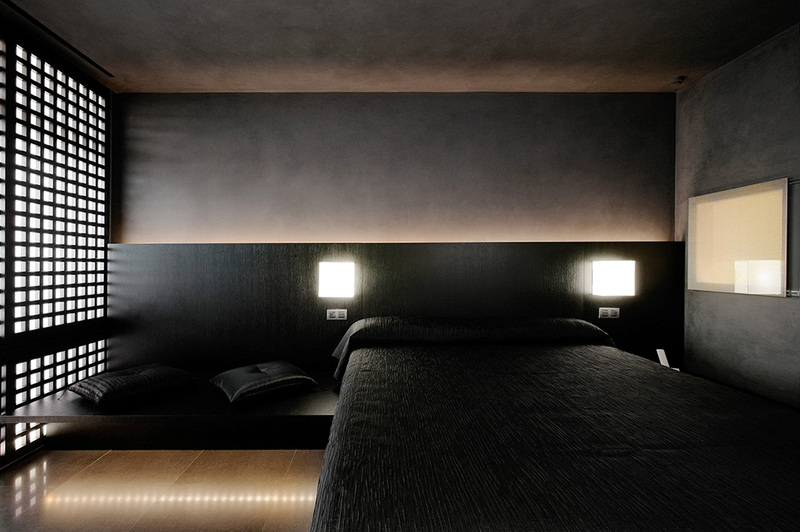 The same simplicity also reigns in the rooms where white and grey colours prevail to encourage rest and relaxation. Marc Newson has also designed most of the furniture for this project: bed, table, chairs and a single multi-functional piece of furniture. 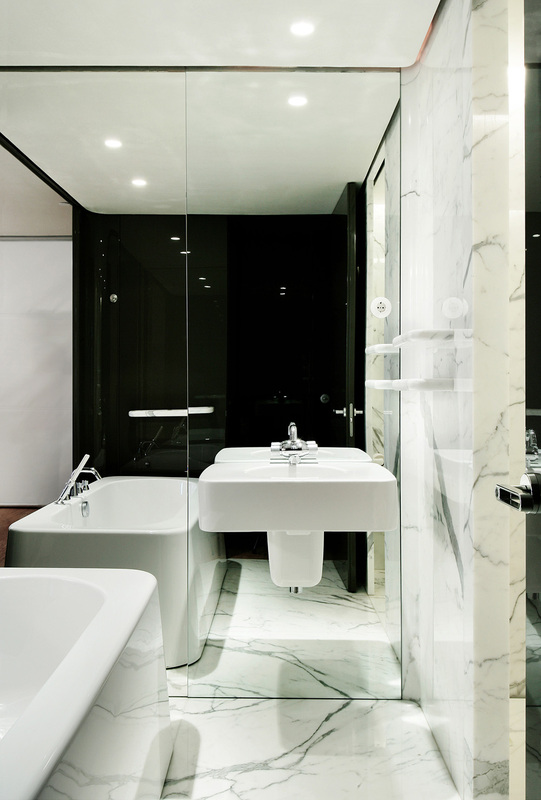 For the finishes of the bathroom he chose Statuario Venato marble from the Carrara quarries. 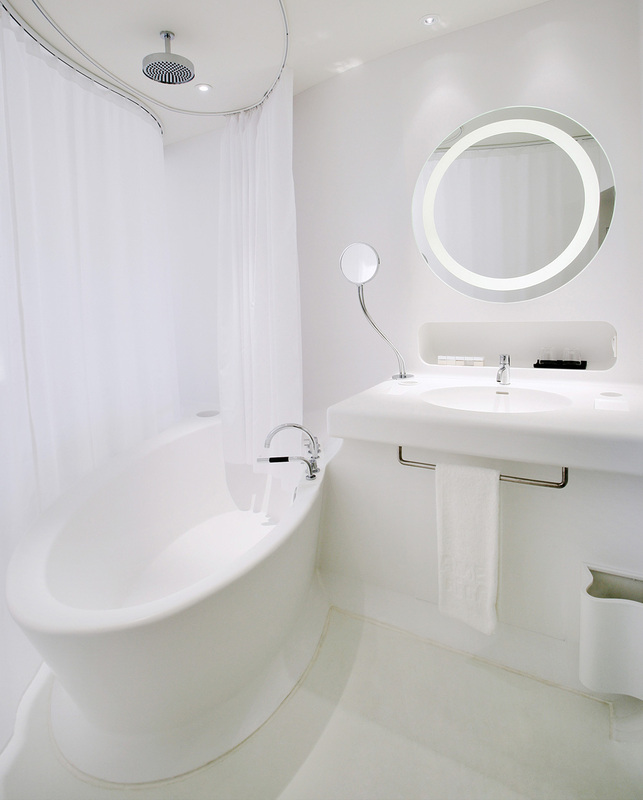 The bathtub and other pieces in the bathroom were also designed by Marc Newson. Seventh floor. An interplay of sinuous shapes. Ron Arad. 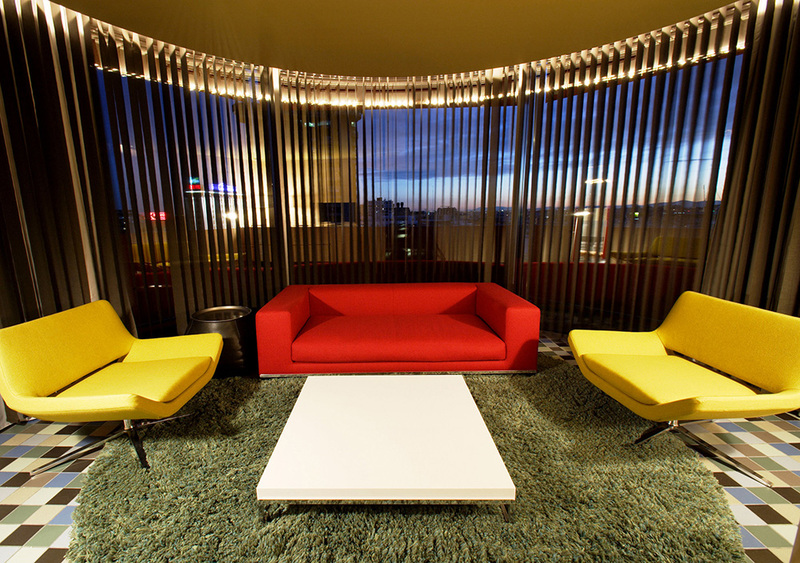 In the centre of the lobby there is a circular sofa made of reflective fibreglass, foam and Alcantara in anthracite grey. Large LCD screens hang on the walls and display different images. 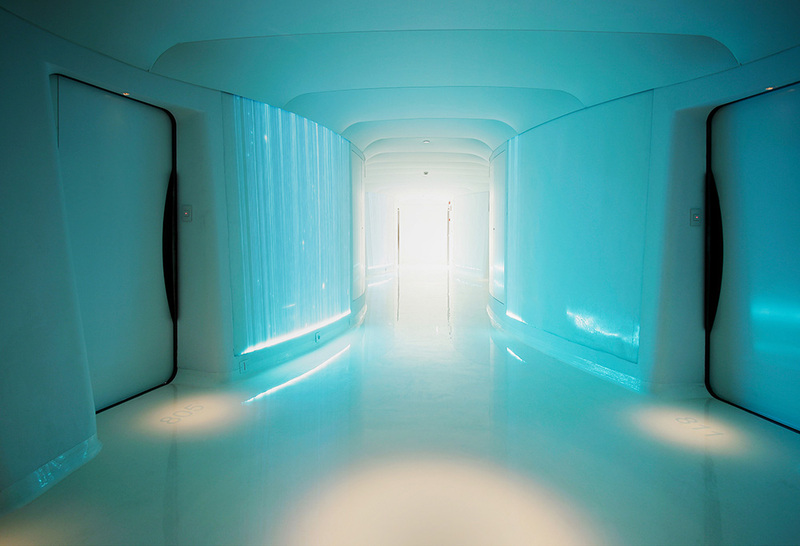 The floor in the lobby and hallways is made of elastic resin, and the ceiling curves downwards, seeming to swoop over the guest, although in reality it manages to creative a cosier, more modern space. 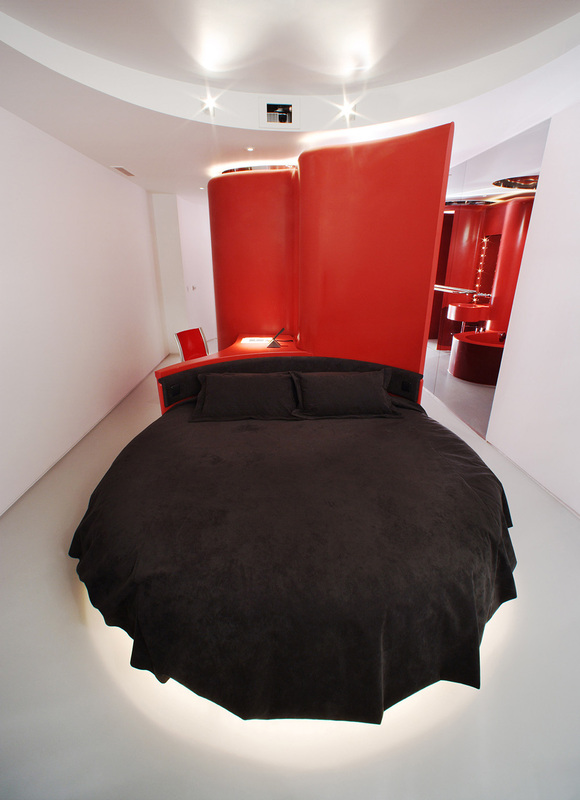 The central element in the rooms is a curved, continuous wall, white in some rooms and red in others, that separates different functional zones and acts as a single multi-functional object which provides different functions: in the room it continues as a table and then as a headboard of the round bed. 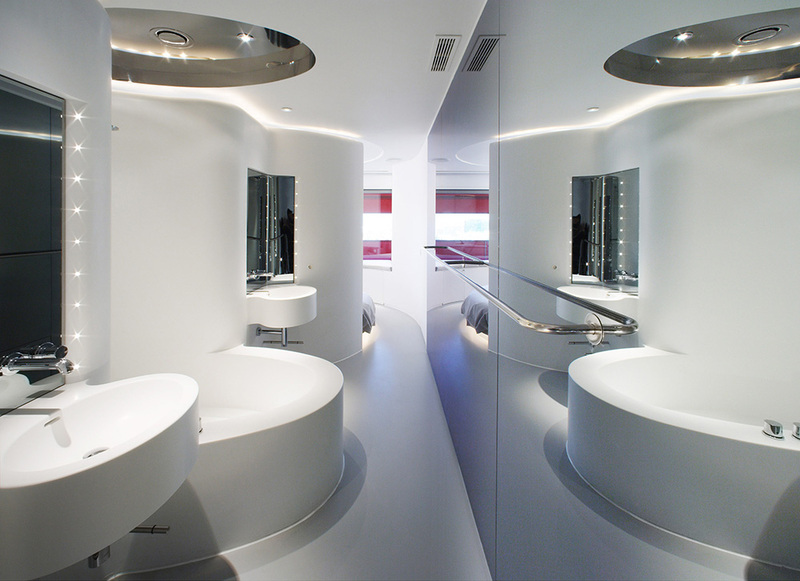 In the bathroom, it turns into a bathtub, a washbasin and a toilet. The shower and toilet have stainless steel ceilings. 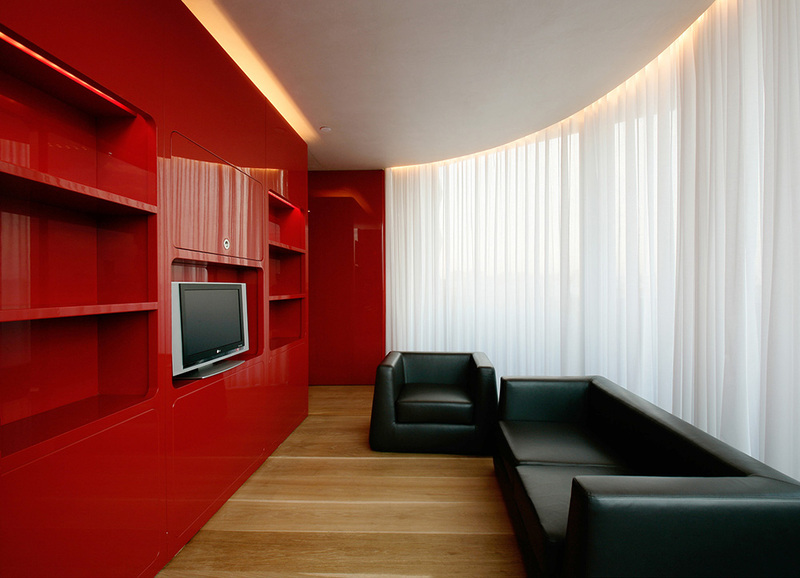 Arad seamlessly blends both materials, achieving an extremely modern space with a touch of high technology. Eighth floor. Light in motion. Kathryn Findlay, Jason Bruges. 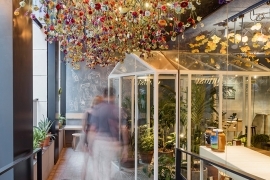 Space of the eighth floor of the hotel is the result of collaborative work of the architect Kathryn Findlay and interactive designer Jason Bruges. Findlay and Bruges have determined that guests must play with the space and discover it for themselves. First of all, the lobby features a bench in the shape of a small maze. This is a project just waiting for the guest to join in. 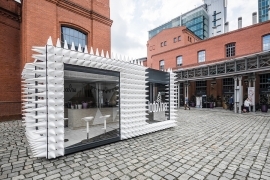 It is an interactive conception of the space, one of the premises underlying the work of both designers. 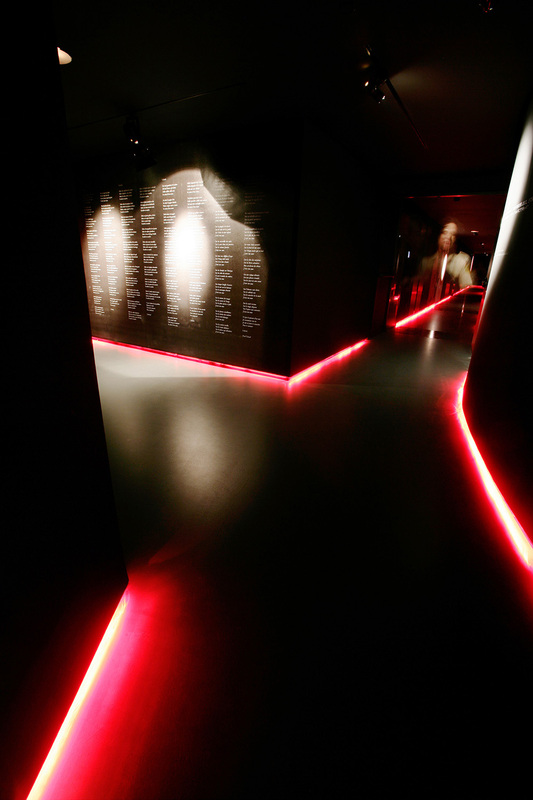 Fibre optic panels have been designed for the lobby, which Bruges calls Memory Wall and which capture the guests’ movements only to later project a distorted image of them over the panels made with points of colour. The ceiling is a stretched canvas curving outwards, creating a bulbous structure. In the hallways, the designers have created what they call Flock Wallpaper, which reacts to the movement of whoever is walking down the hall. 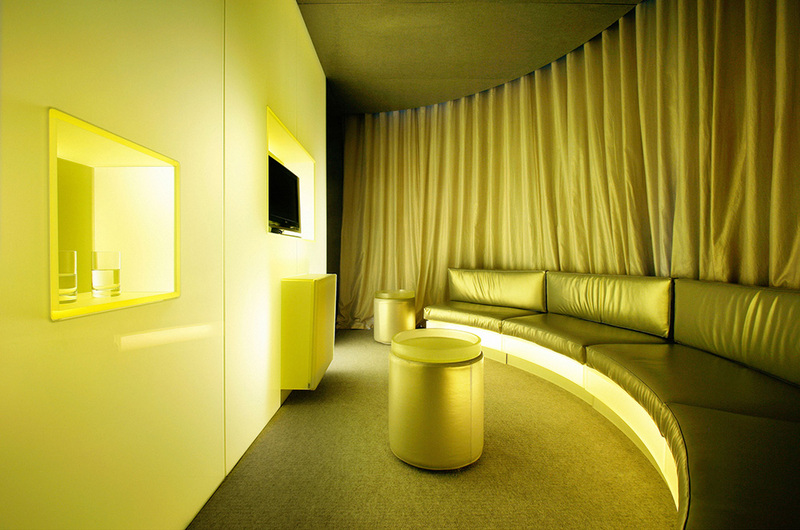 Two projects created exclusively so that guests interact with the space and enjoy themselves. 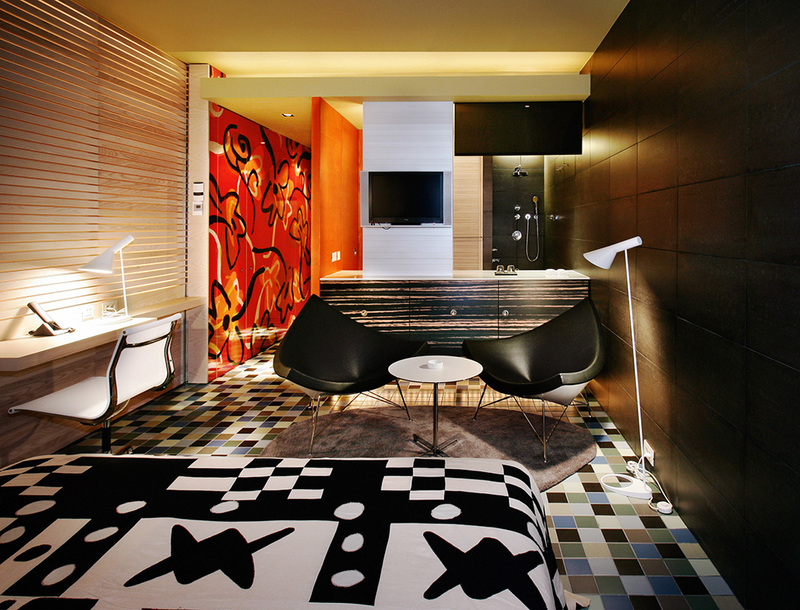 The most noteworthy feature of the rooms is that Findlay refused to consider walls or doors. 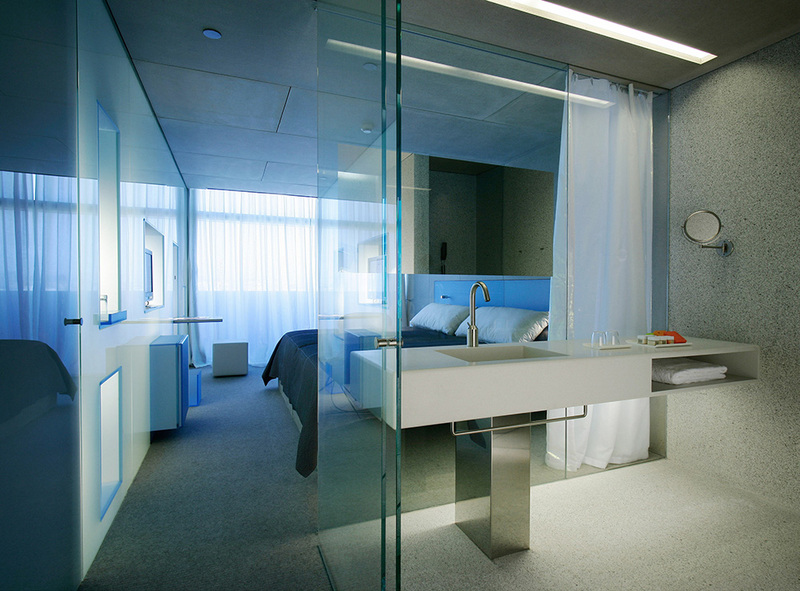 The separation between the bathroom and the room is made through simple, sweeping white curtains. 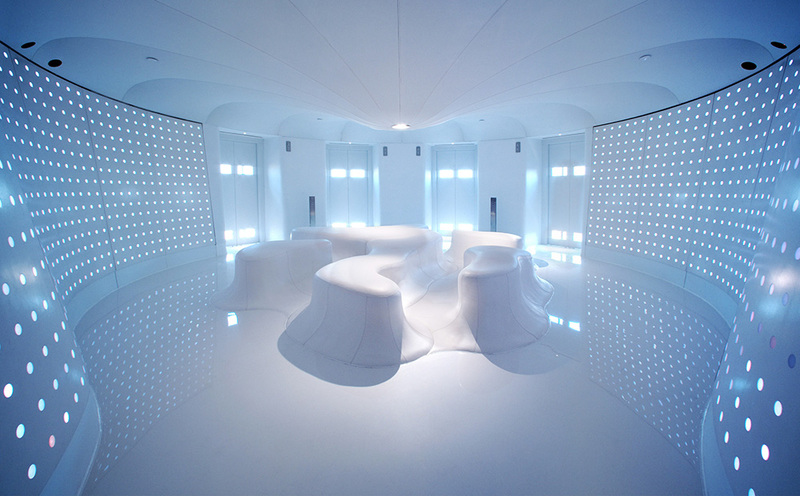 The entire room is white and forms a single space. Depending on how it is approached, the bathroom is on one side, the closet on the other and the bed is always towards the back of the room. 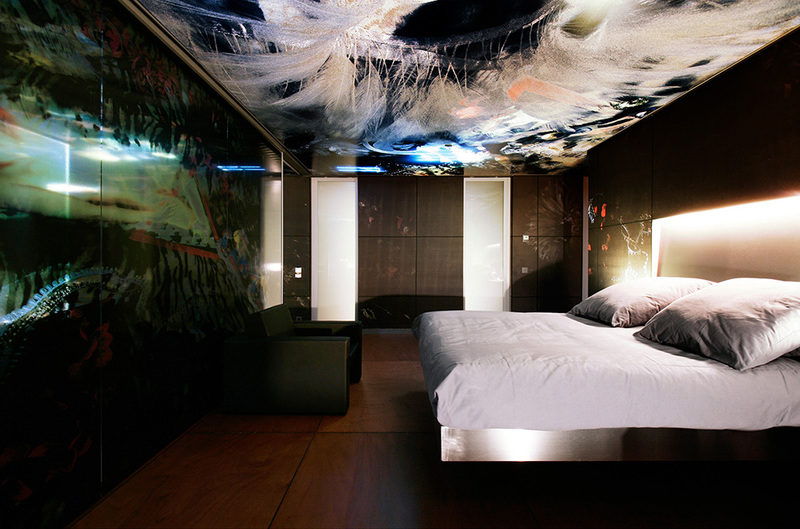 The most remarkable thing about the bed is that it is suspended from the ceiling and does not touch the floor. Its headboard also acts as a desk. The television, placed over the bed, is flush with the ceiling. In the window looking out onto the fa?ade, the architect takes advantage of the space for designing a divan with cushions that span the entire window. The entire space within the room is thus liable to being used. 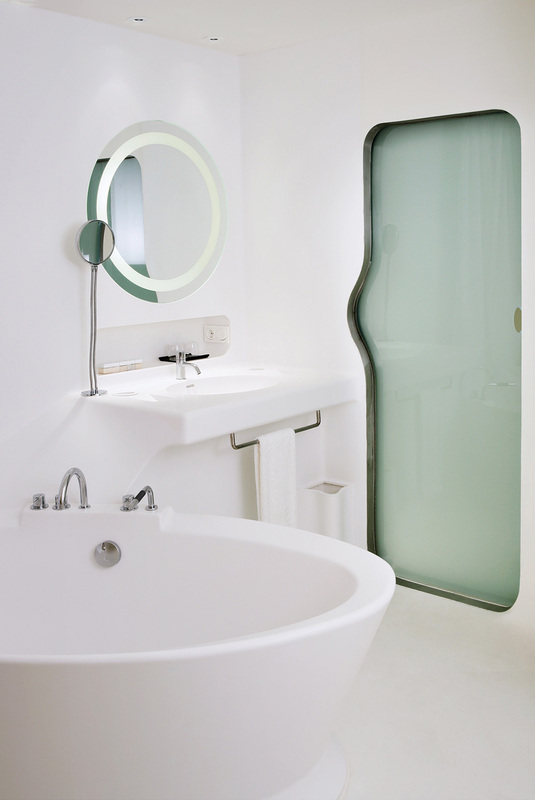 The toilet is the only part that is clearly separated from the room by a translucent glass door. Ninth floor. Boxes of colours. Richard Gluckman. 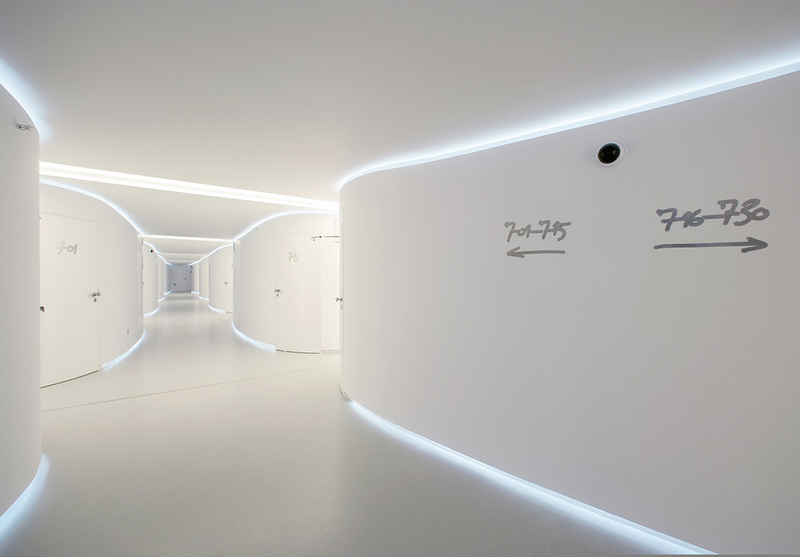 The initial architectural concept derived from the capsule hotel notion of a ‘box within a box’. This concept is used to organize the approach to the different kinds of activities that take place within the small space of the hotel room. 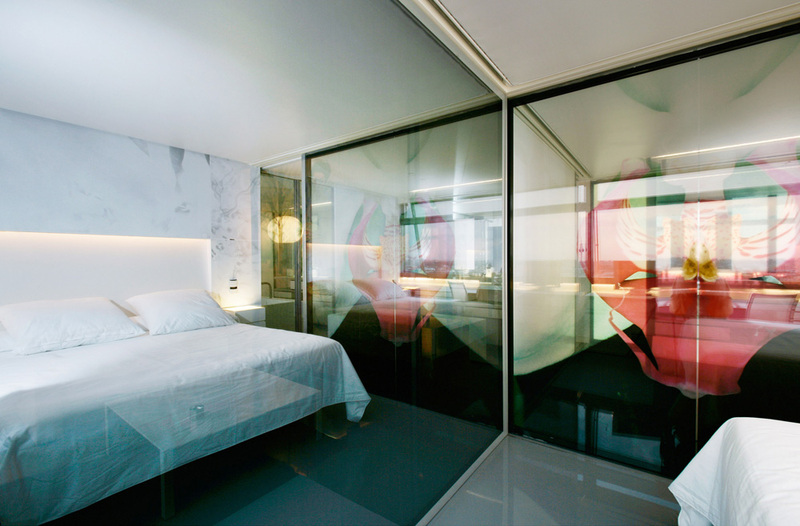 Each room has a wall of translucent glass containing four methacrylate niches. 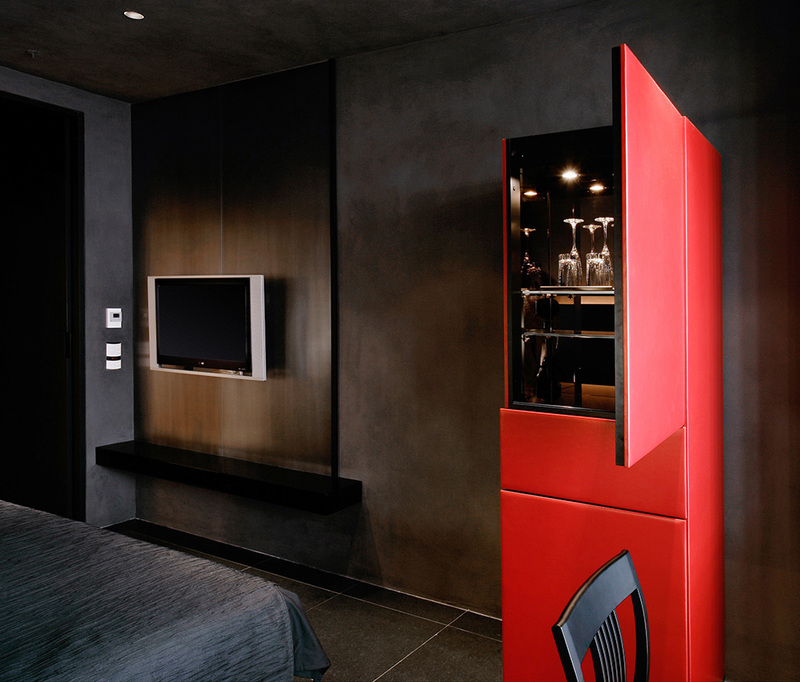 Gluckman has differentiated the rooms by changing the colour of the niches. The half on the north side are blue, and the half facing south are yellow. The biggest box, in the middle of the room, houses the television. To the left is the telephone box, which also serves as a writing desk. To the right are two other boxes with different uses, such as for putting drinks, a notebook, glasses or wallet. Another noteworthy feature of the interiors is decoration. Lobby and hallways have an industrial appearance. The hallways look as if they belong in a factory or a recently installed office, and, to reinforce this sensation, fibre cement has been used on the ceiling and walls. This industrial touch is continued in room design, but here it is a little more sophisticated. 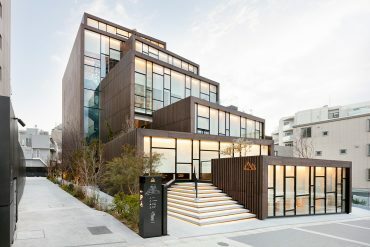 As Gluckman himself has explained, he has combined ‘rich’ materials, such as methacrylate and luxurious fabrics in metallic tones, with ‘poor’ materials, such as fibre cement board. 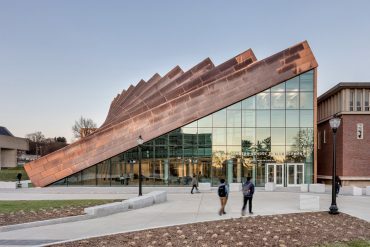 In addition, natural substances like mica-flecked cement, felted-wool, and Spanish granite are used alongside artificial ones like acrylic and recycled plastic. Tenth floor. Japanese tradition. 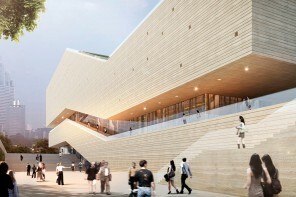 Arata Isozaki. The tenth floor of the Hotel Puerta Am?rica refers guests to the traditions of Japanese culture. Isozaki has brought plenty of oriental references into the interior, which guests discover as they undertake different activities within their room. Contrast is the key idea for the lobby and hallways. 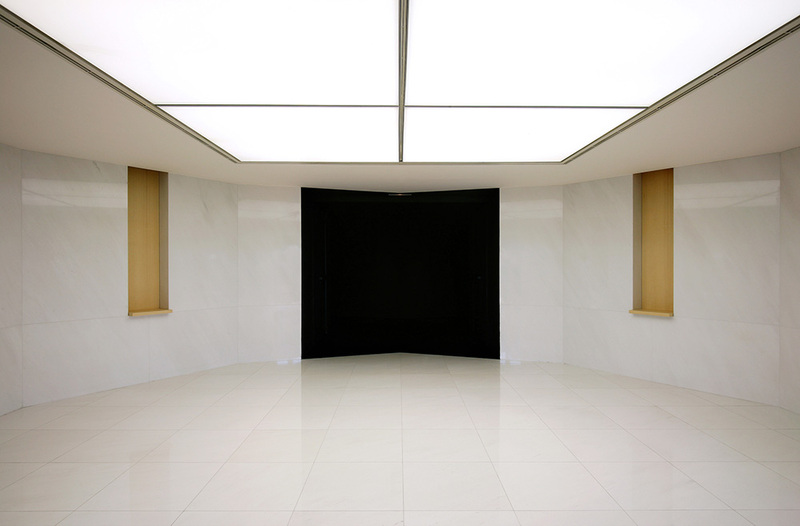 The lobby is a decagon painted with a special white scraped paint and tiled in marble, in stark contrast with the dark grey paint used along the hallways, which is also rough to the touch, as well as the black chosen for the wool carpeting. The Japanese tradition in the home, featuring minimalism, tranquillity and well-being, seem to be the ideas governing the interior design of the rooms. Each detail transports the guest to a typical Japanese room. Dark colours predominate, although the area is nonetheless spacious and well-lit. 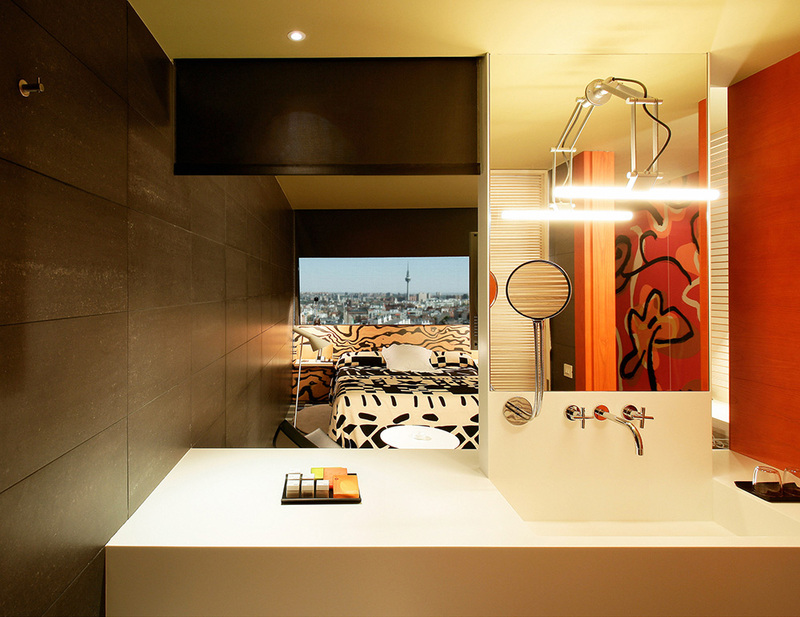 Cool materials and colours contrast with the brightness and warmth of the bathroom. 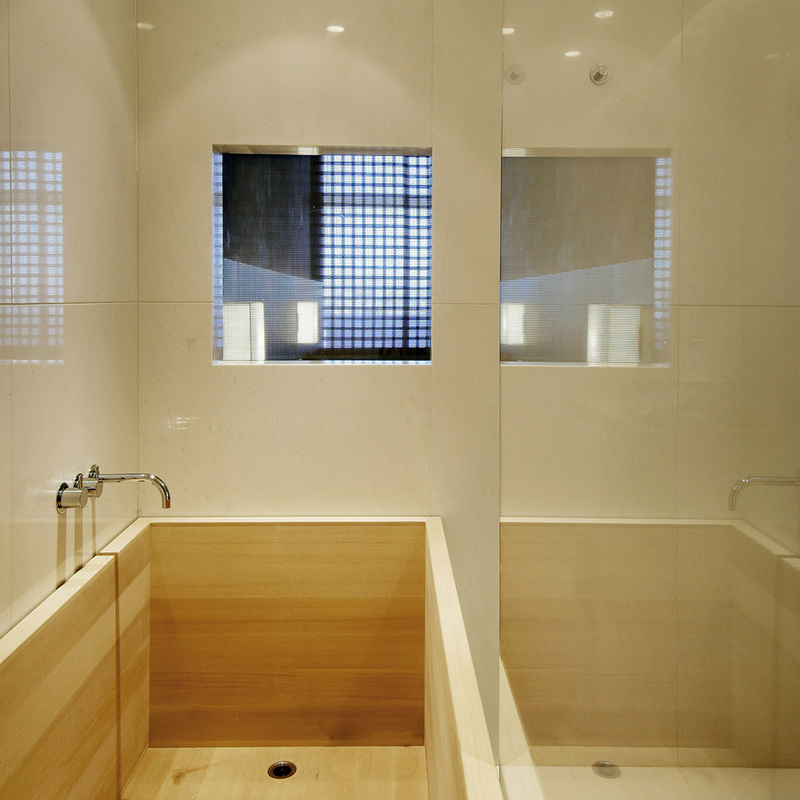 Isozaki has proposed a bathroom and shower made of hinoki wood, known for its light tones. Eleventh floor. Good vibrations. Javier Mariscal and Fernando Salas. ‘Simple solutions without formal showiness or major technical complications; contained, functional, long-lasting, attempting to create visual perspectives in a habitat viewed as multifunctional, not as a mere bedroom.’ That is how Javier Mariscal himself defines the design of the eleventh floor of the Hotel Puerta Am?rica. 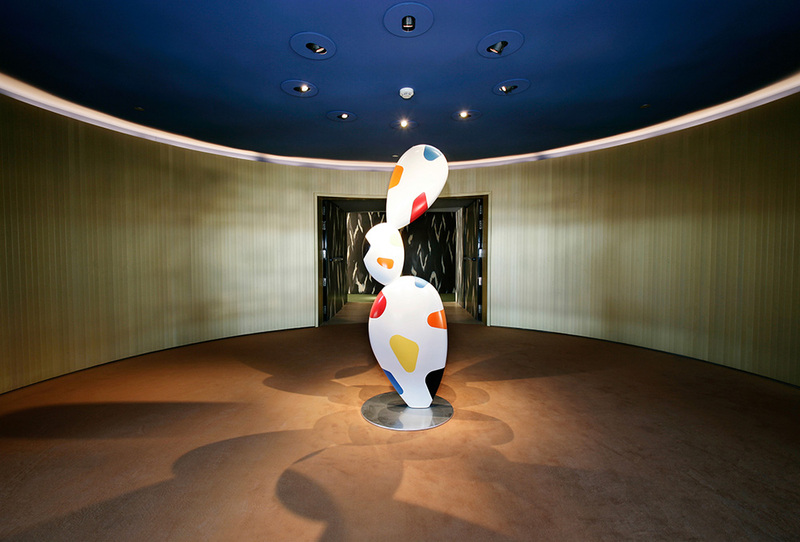 In the centre of the lobby there is a Cactus sculpture which is made out of coloured Corian and stands on a double platform of stainless steel and iron. 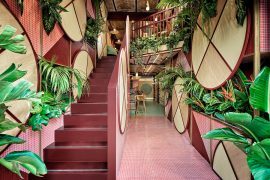 In this area the carpet is orange, contrasting with the green chosen for the hallway, whose walls are covered with striped Formica. 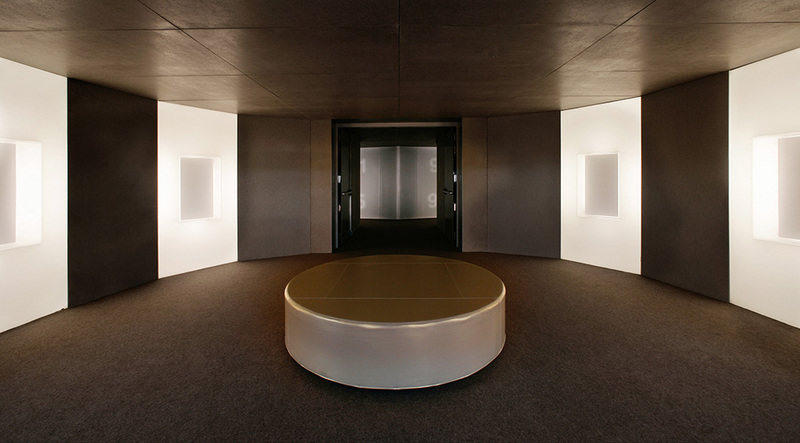 Throughout the hallway there are illuminated glass cabinets resembling transparent light boxes and displaying different objects also designed by Mariscal. The aim is to make the way to the rooms more engaging. 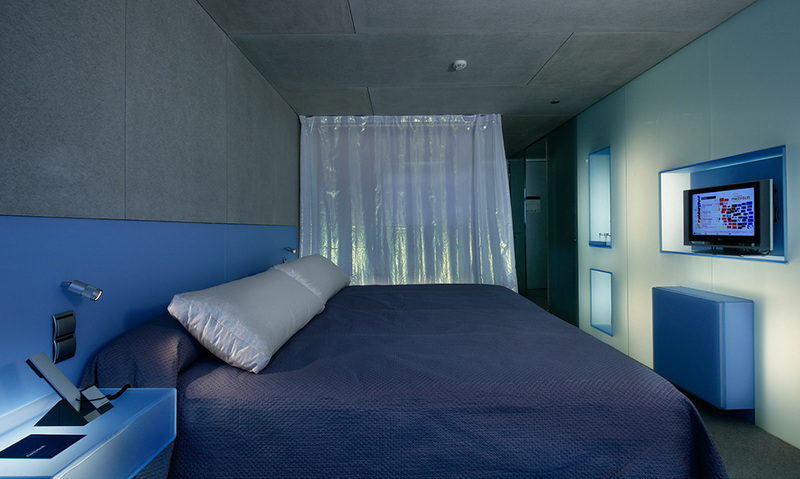 Mariscal has designed the rooms of the eleventh floor as a temporary home for everyone who stays there. 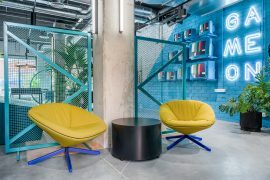 As the designer explains, the goal was to create a space that ‘can be used by a lot of people who might not have the same tastes or needs’. Precisely for this reason, Mariscal says that he has not tried to ‘perform an exercise in style, nor futurism. Quite the opposite – I have tried to achieve an anonymous character, without imposing the author’s signature too much so that it will age well’. Mariscal acknowledges that he has tried to convey ‘good vibrations, a sensation of being in a comfortable space’. His inspiration: ‘the functionalism of the 1950s, but without this having had too much influence afterwards’. Guests are presented with an area where the bathroom reigns supreme. The only enclosed area is the toilet booth, isolated by means of an ash wood trellis, which also simultaneously serves as a large lamp as it is backlit. At its back, the mirror supports the plasma TV screen. 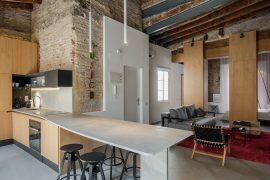 The white Corian work surface has a dual function; while in the bathroom it is used as a sink and general surface, in the living room it becomes a piece of furniture, finished in striped Formica and holding the bar, fridge and audiovisual equipment. Large-scale colourful flower prints predominate in the bedroom, covering the headboard and closets, hidden behind a panel. The bed is located against the window. In this way, natural light hits it from behind and permeates the whole room. One of the sides of the bedroom is finished with a backlit wooden trellis, giving guests the feeling of being outdoors. Twelfth floor and penthouse. Jean Nouvel. 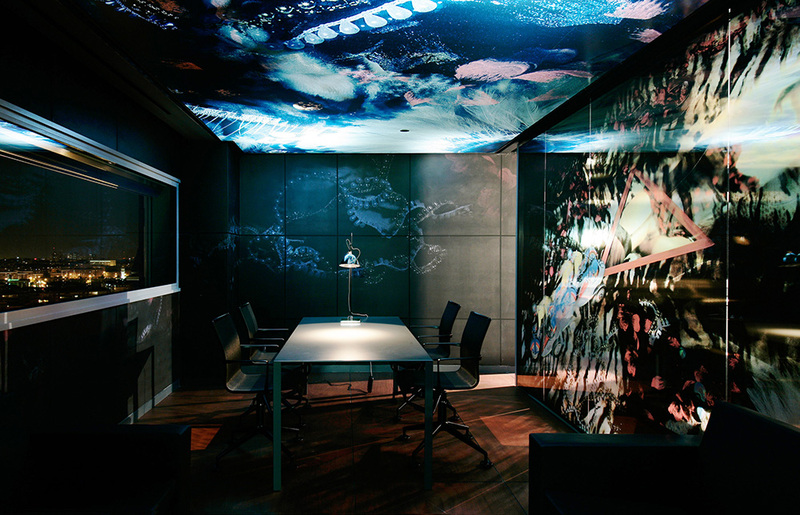 On the twelfth floor, the French architect has designed twelve suites where two names are of particular importance to the concept and design: the photographers Nobuyoshi Araki and Roland Fleischer. As the original idea is that this floor be devoted to pleasure, the French architect has decided to use the walls to display the work of these two photographers, who play with interesting images of the human body and nature. Araki’s photographs, which cover the rooms on the western side of the hotel, are notable for their expressive force. Those by Fleischer, which are completely abstract, cover the eastern wing. 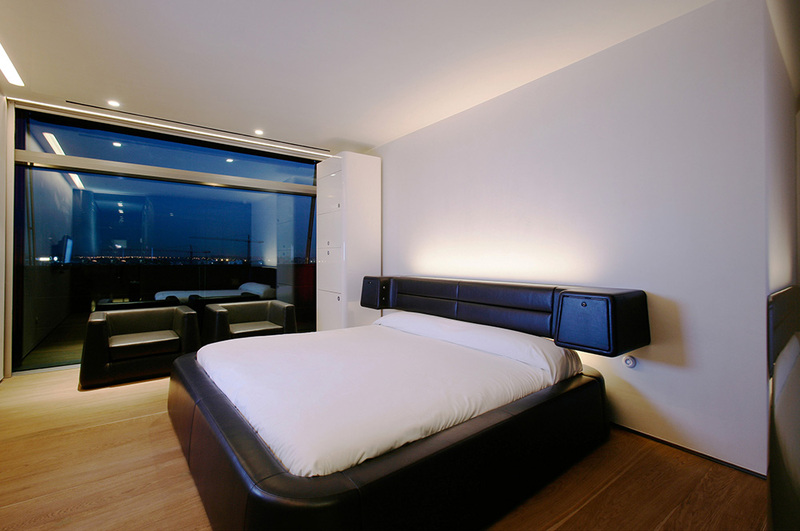 The larger suites have a guest room boasting views of Madrid, with a floor-to-ceiling glass wall looking onto the street. All the rooms feature a system of sliding panels with rails on the floor and the ceiling to allow guests to organise the space as they wish. In fact, the most individual feature of the rooms is that the clients themselves can act as the architects, reorganising the area to suit their own tastes. Perhaps you would like a large bathroom or a spacious living area. The panels make all this possible. The terrace and bar prevail on the hotel’s penthouse floor, as do a special small pool and spa. But there is no doubt that this floor’s true standout is its impressive views of Madrid. Nouvel has also designed a glass walkway that connects the different spaces, although it is not recommended for vertigo sufferers! A semi-circle with a glass floor, it reveals the whole fa?ade of the hotel right down to the ground. 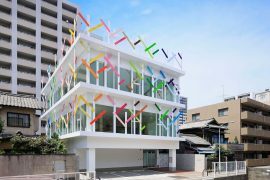 Guests can enjoy the changes in colours provided by the awnings and the poem Libert? by Paul ?luard, which covers the fa?ade in various languages. Photographs are by Rafael Vargas.